• Choose Style from the Format menu. 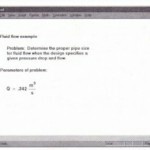 Mathcad brings up the Text Styles dialog box showing the currently available text styles. Click on the “Font” button to modify the text formats such as the font, font size, font styling, special effects, and color. Click on the “Paragraph” button to modify the indentation and alignment for that text style. 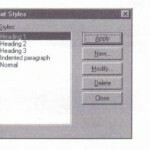 See the section “Text editing” on page 102 for information about the available text and paragraph formatting options. • Click “OK” to save your changes. Any new text regions to which you apply the modified text style will reflect the new definition for that text style. In addition, any text regions previously created with the text style will redisplay according to the definitions of the new text style. • In the Define Styles dialog box, enter a name for the new style in the “Name” text box . • If you want to base the new style on one of the existing styles in the current worksheet or template, select a style from the “Based on” drop-down list. • Click on the “Font” button to make your choices for text formats for the new style. Click on the “Paragraph” button to choose alignment and indentation options for the new style. • Click “OK” when you have finished defining the new style. Your new style will now appear in the Text Styles dialog box and can be applied to any text region as described in the section “Applying a text style to a text region” on page 109. When you save the worksheet, the new text style is saved with it. If you want to use the new text style in your future worksheets, save your worksheet as a template as described in Chapter 4, “Worksheet Management.” You may also copy the text style into another worksheet that doesn’t have the style simply by pasting in a region that has that text style. If you base a new text style on an existing text style, any changes you later make to properties of the original text style that carry over to the new text style will be reflected in any text regions that have the new text style. In addition, the properties of the new text style will be updated for future applications of the style. 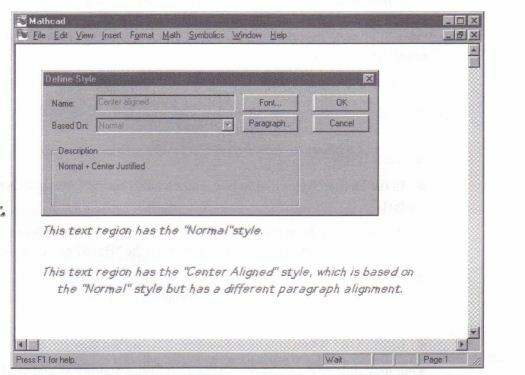 In the example of Figure 5-2 the “Center Aligned” style was created based on the “Normal” style but with center paragraph alignment instead of left alignment. Figure 5-3 shows how the appearance of the text with the “Center Aligned” style will change when the base “Normal” style is updated. • Select one of the available text styles from the list. The text style is removed from the list of available text styles. 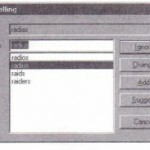 Any text regions in your worksheet whose text and paragraph properties were defined in terms of that text style will continue to display the properties of that style, however. Figure 5-3: A new text style based on the properties of an existing text style.